I have just read the vivid record indeed from Chris, a fellow ‘Saltdean lad’ in the late 50s and early 60s. Oddly, our paths did not cross at the hotel but rather more at the local watering-hole, the Spanish Lady. How clearly I remember working during the school, and later college, holidays at Butlin’s, where I met my future wife. My first job was in the steaming hot kitchens, placing scalding rashers of bacon by hand onto a large tray (why didn’t they issue us with tongs?). After a couple of days of that, I complained loudly and was transferred to the Sandwich Room near the Ballroom, run by a Mrs ‘B’. In the following year I did a stint disposing of rubbish and working with an oddball Scotsman in the beer cellar. The deliveries came in roughly where the doctor’s surgery is now and there was no let-up when the metal casks came down the chute – you just had to keep stacking them higher and higher. Yes, there was an enjoyable social side (but security would chuck you out if they found you there in the evenings! ), which included table tennis and I think snooker on one of the upper floors. 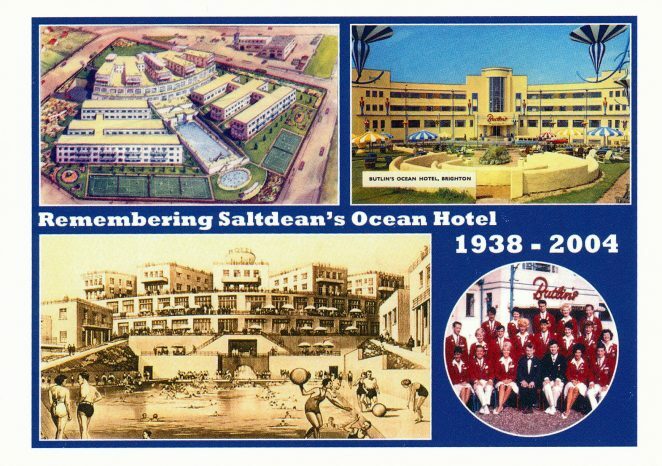 It was the era of cigarettes, and the smell of smoke and the brightly coloured tin ashtrays on the ballroom tables are among my enduring memories of the hotel. Luckily, the developers moved in relatively swiftly after the hotel’s closure, so the people of Saltdean – and visitors – did not have a distressing eyesore to look at for years as was the case with the Lido in the 1950s. Jimmy Noon and his wife, Lynda, an ex-Redcoat and former Entertainments Manager gave me some enjoyable interviews which I have carefully preserved on tape.